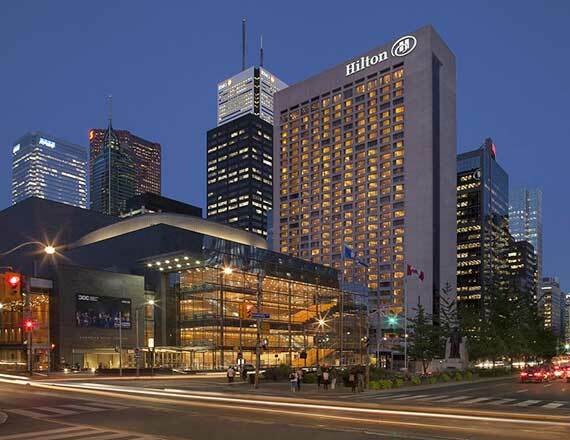 The 2019 Event & Arena Marketing Conference will be held at the Hilton Toronto. The EAMC room block will be $259 CAN (currently around $193 USD) from Sunday, June 9 - Saturday, June 15, 2019. Please note that our room block is nearly full. If you are unable to book using the reservation link above, please try calling the Hilton Toronto at (416) 869-3456 to make your reservation. Information on the overflow hotel(s) will be posted here soon. The Hilton Toronto is located 26 km. from the Toronto Pearson International Airport and 2 km from the Billy Bishop Toronto Island Airport. Fares are estimated at approximately $60 CAN from YYZ and $10 from YTZ.